Marwo Weagai, a Grand Bassa Market vendor, participates in an MCHIP-funded initiative to increase access to family planning services. 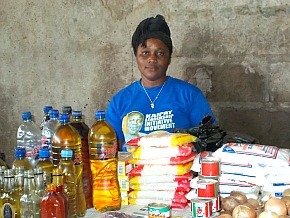 Buchanan, Liberia—When Marwo Weagai opens for business at the local market here, she sells bags of salt, bottles of palm oil and dried spices—and also offers free family planning (FP) advice and supplies to interested shoppers. Marwo is among 22 market vendors participating in an innovative program in three counties in Liberia to increase women’s access to FP counseling and services. Many of the market vendors know from personal experience the challenges faced by Liberian women who want a safe and reliable method to plan their families. For example, long lines at health facilities are a deterrent to accessing services for women who are busy caring for and trying to support their growing families. In Liberia, the average number of children per family is five. And, according to the latest Liberia Demographic and Health Survey (LDHS 2007), the unmet need for contraceptives is 36 percent. Moreover, the maternal mortality ratio is 994 per 100,000 live births—one of the highest in the world. In Grand Bassa, the volunteer counselors promote healthy behaviors and provide counseling, condoms and refills for contraceptive pills; they refer first-time users to a health facility. 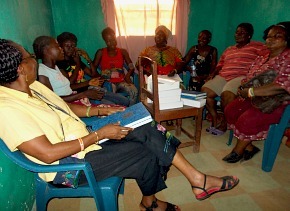 MCHIP has been working to increase FP services in Liberia since 2010. In addition to strengthening the skills of FP providers and integrating FP and immunization services at selected health facilities, MCHIP is identifying effective approaches to increase FP services and awareness through community-based distribution. To date, the market contraceptive program has served more than 1,500 clients in markets in the three targeted counties of Grand Bassa, Margibi and Montserrado. Reaching out to adolescent girls has been a priority for the program. The statistics are telling: in Liberia, 48 percent of girls have begun bearing children by the time they are 18 (LDHS 2007); Grand Bassa County has a teenage pregnancy rate of more than 68 percent (UN 2008 Common Country Survey); and among all women of childbearing age, 25 percent of deaths are associated with maternal complications. Consistent access to FP services can save lives. Clients and members of the Marketing Association discuss the program with MCHIP staff. Other market FP peer providers have also noted that the program is helping women to prevent unwanted pregnancy and unsafe abortions. As part of this program, MCHIP has trained both market peer providers and Ministry of Health and Social Welfare health facility providers. In addition, MCHIP has supplied ongoing supportive supervision and data collection for routine monitoring. During a visit at the Monrovia Junction market in Buchanan, an MCHIP staffer had the opportunity to speak with clients of the market contraceptive program; one woman reported that: “We are grateful, because this program is really good for us. It helps us to space our children and it also makes it easier for us to get our refill,” without spending a lot of time waiting in long lines at a busy clinic.